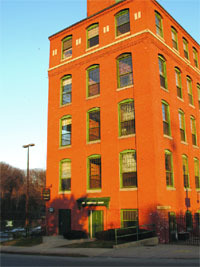 The third annual Western Mass. 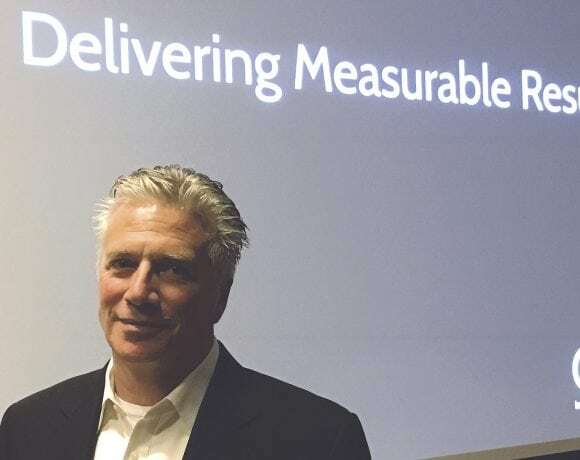 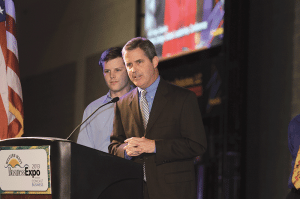 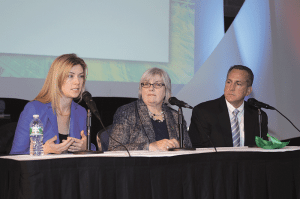 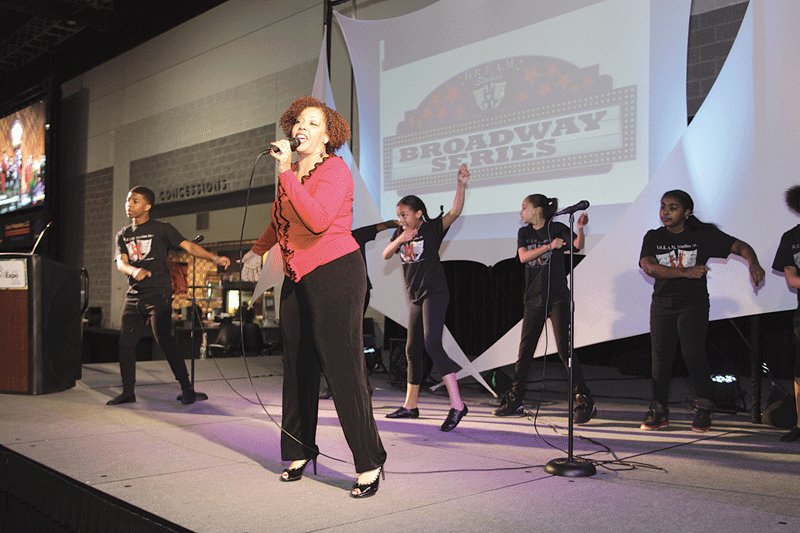 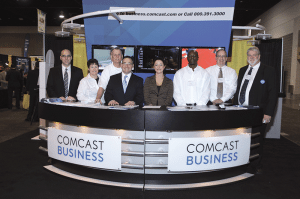 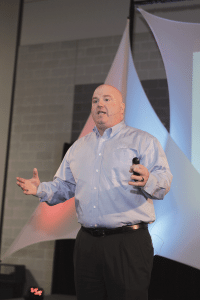 Business Expo, produced by BusinessWest and again presented by Comcast Business, was staged Nov. 6 in downtown Springfield. 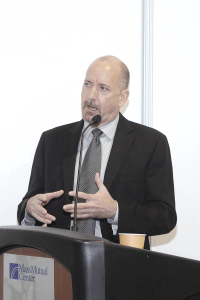 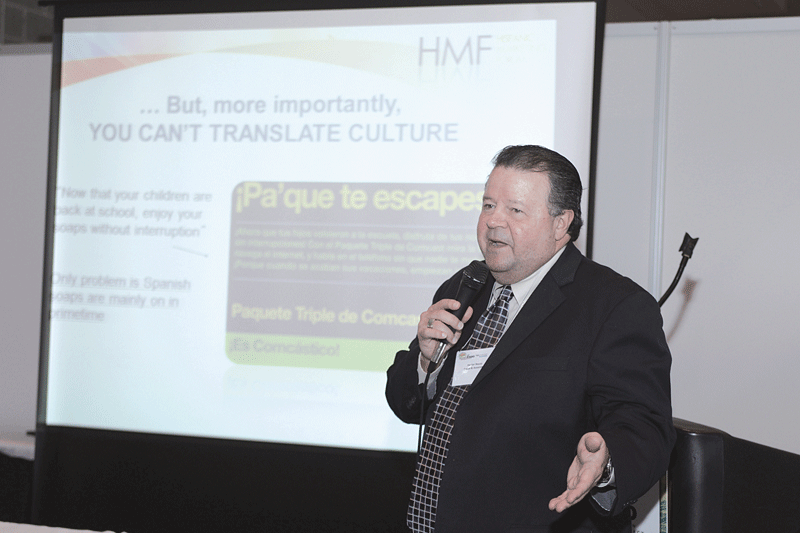 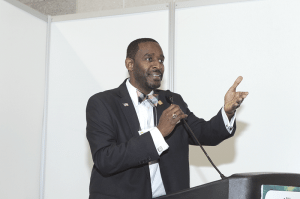 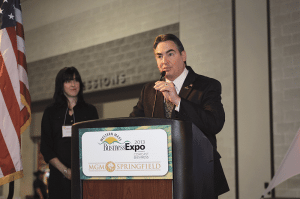 More than 2,200 attendees passed through the doors at the MassMutual Center, and they had an opportunity to visit more than 120 exhibitor booths, take in a dozen educational seminars, and watch several special presentations on the Show Floor Theater. 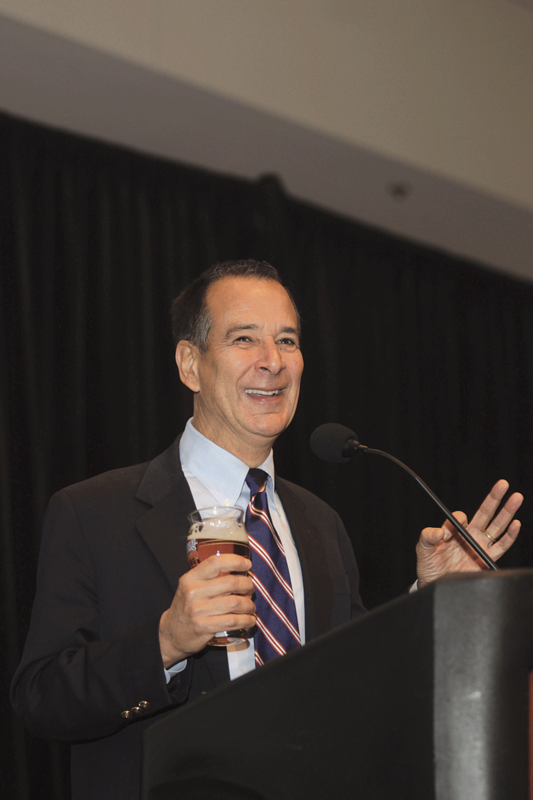 The day’s programming started with the ACCGS November breakfast, featuring Jim Koch, founder of the Boston Beer Co. and the Samuel Adams Brewing the American Dream Program. 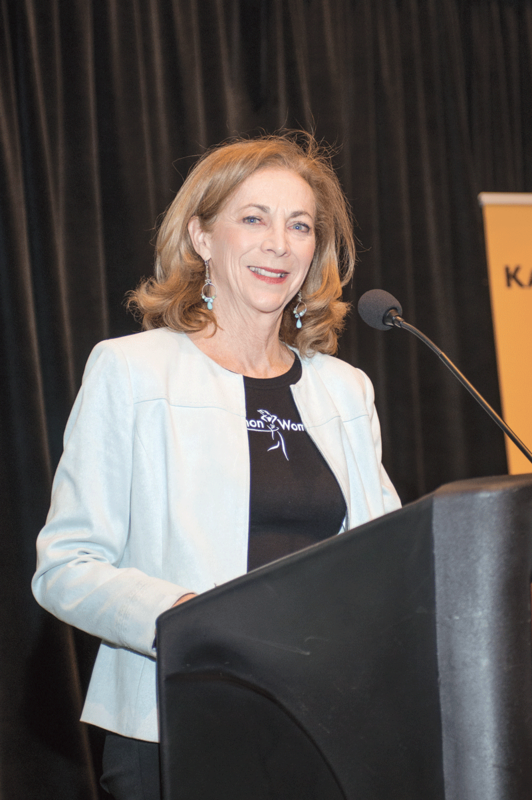 Other highlights included the Professional Women’s Chamber November Luncheon featuring Kathrine Switzer, the first women to run in the Boston Marathon, as well as a Pitch Contest and Demo Day presented by Valley Venture Mentors, the day-capping Expo Social, and the announcement of the winner of the Greater Springfield Extreme Website Makeover contest. Far left, Kate Campiti, associate publisher of BusinessWest, looks on as Springfield Mayor Domenic Sarno welcomes the crowd and kicks off the Expo. 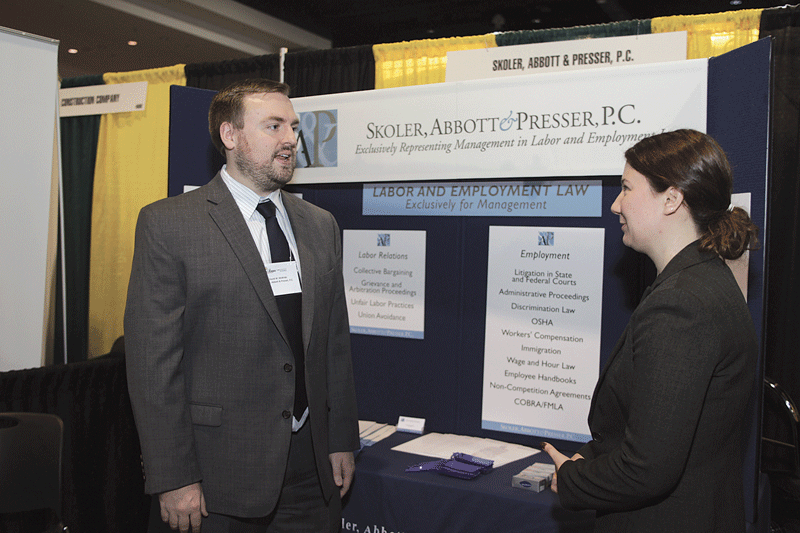 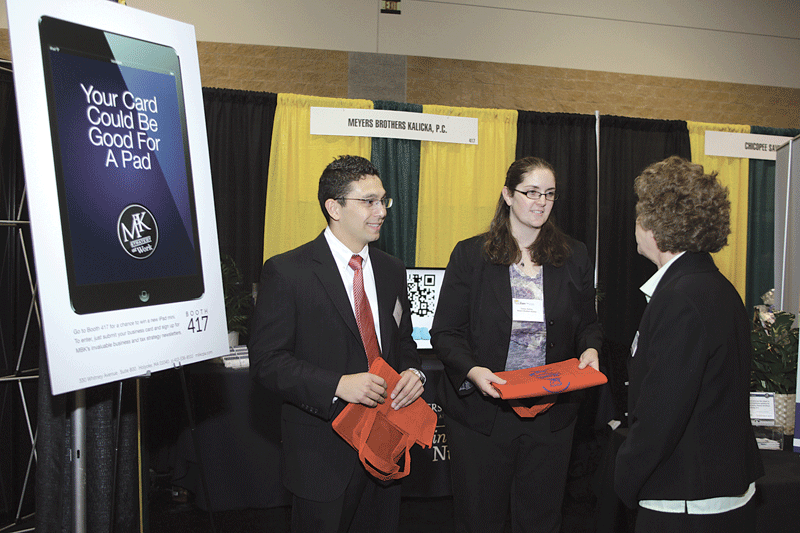 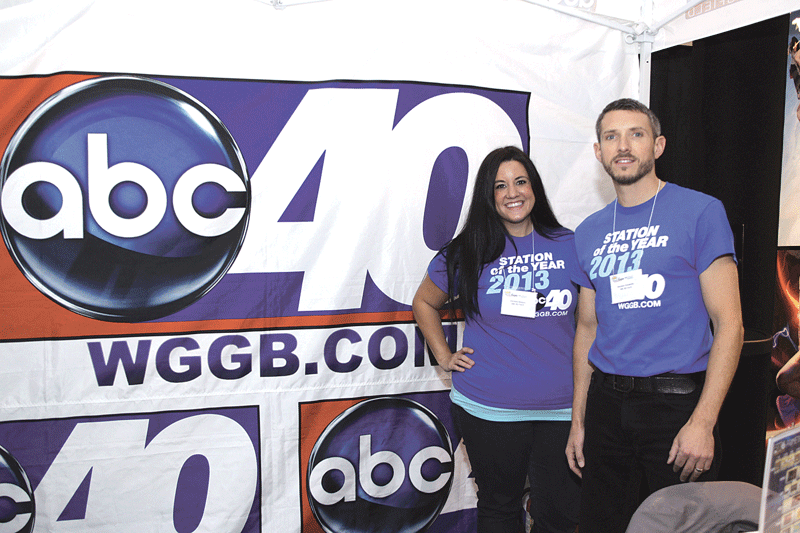 Left, members of the Young Professional Society of Greater Springfield represented the nonprofit networking organization at the show. 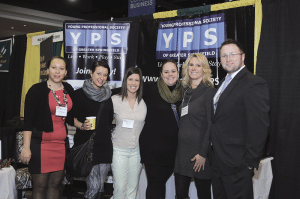 From left are Kristin Foley, senior employment coordinator at Human Resources Unlimited; Stephanie Killian, event coordinator/marketing assistant at Inspired Marketing; Ashley Clark, commercial services officer at Westfield Bank; Jill Monson, owner of Inspired Marketing; Claudine Gaj, owner of Magic Spoon Catering; and Jeremy Casey, assistant vice president/commercial services officer at Westfield Bank. 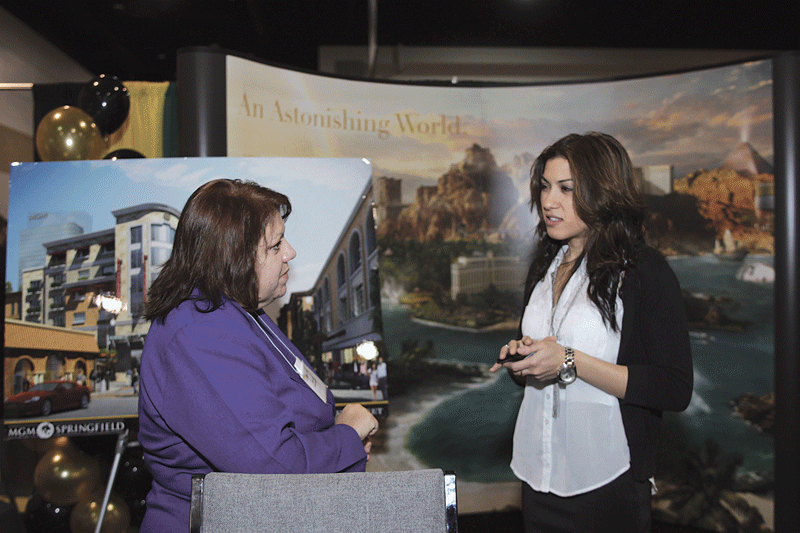 Below left, Wendy Bryne, left, strategic sourcing manager at MGM Resorts International, speaks with Sophia Sarno, office manager and sales at WhiteStone Marketing Group, at the MGM booth. 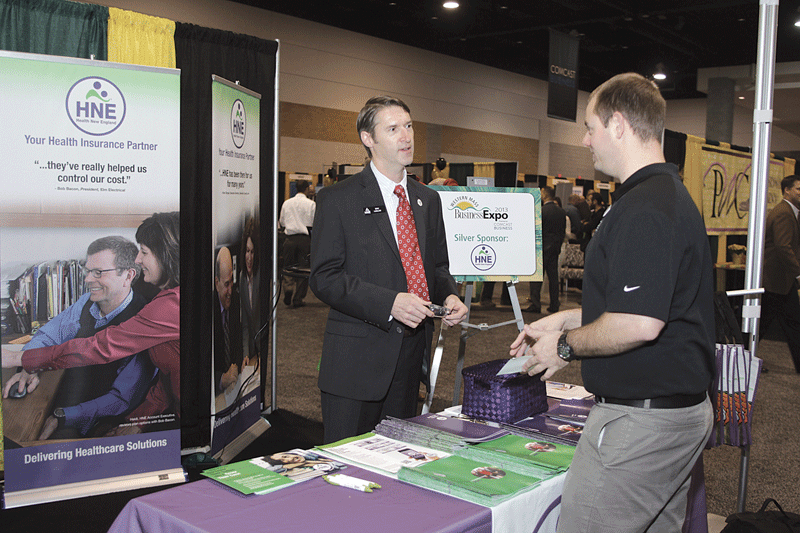 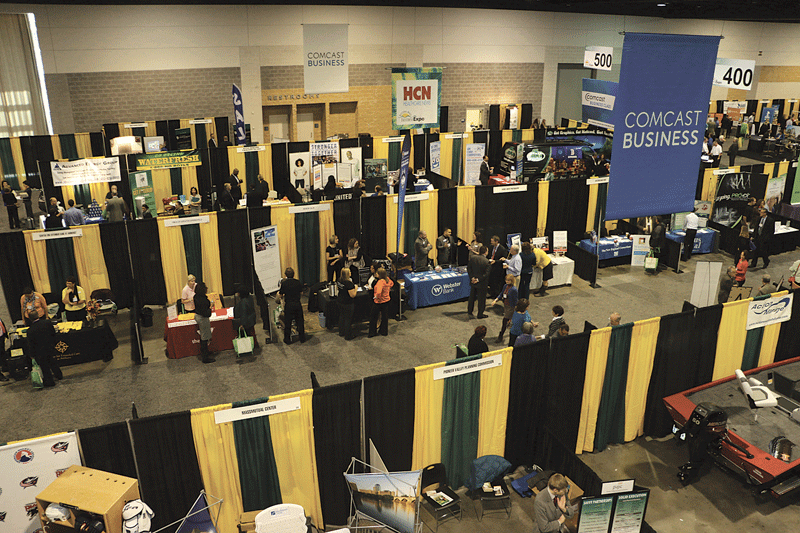 More than 120 businesses and nonprofits exhibited at the Expo. Among those seeking the attention of attendees were (clockwise from far left): QualPrint in Pittsfield, represented by, from left, Karen Vosburgh, head estimator, Michael Lennon, account executive, and Audrey Procopio, director of Marketing and Human Resources; Comcast Business, represented by, from left, Adam Dubilo, sales leader, Tina Peel, business account executive, Tim O’Brien, client solutions engineer, Charlie Tzoumas, regional vice president, Stephanie Bedard, marketing communications and operations specialist; Jessie Horne, commercial technician, Tim Paige, business account executive, and Jody Hart, business account executive; and Bay Path College, represented by Sheryl Kosakowski, director of Graduate Admissions (left), and Heather Bushey, associate director of Graduate Admissions. 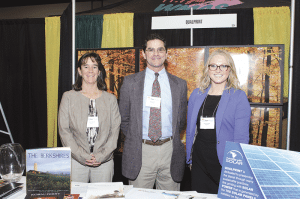 Left to Right from top left: Eric Harlow, broker relations manager with Health New England, speaks with Kyle Seesman, community relations at ProEx Physical Therapy, at the HNE booth; Jill Tower, associate at Johnson & Hill Staffing (left), and June Liberty, director of Operations for the company, meet Albert Rivers, employment specialist with the Department of Elder Affairs in Springfield; attorneys David McBride and Amelia Holstrom await visitors to the Skoler, Abbott & Presser, P.C. 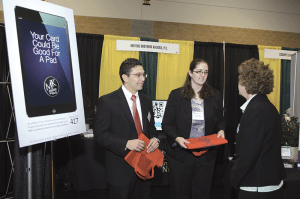 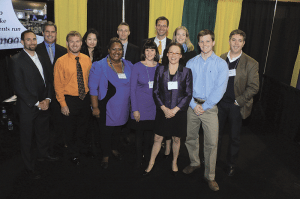 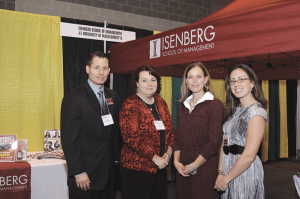 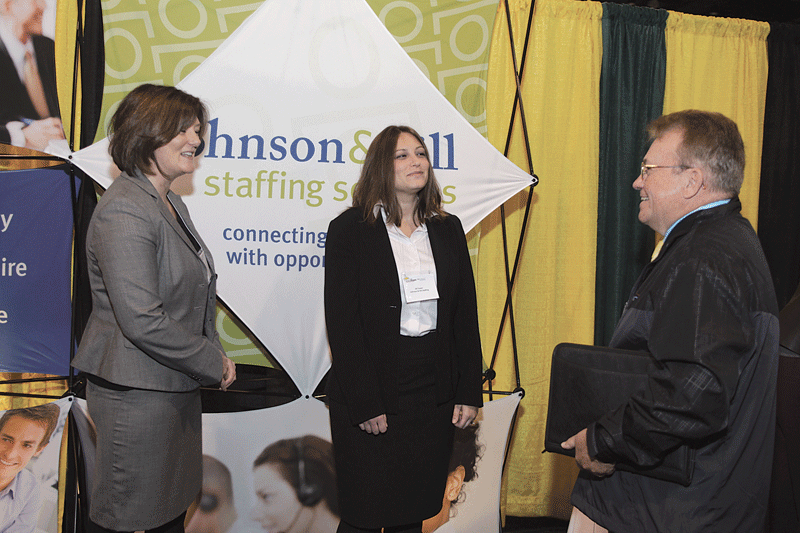 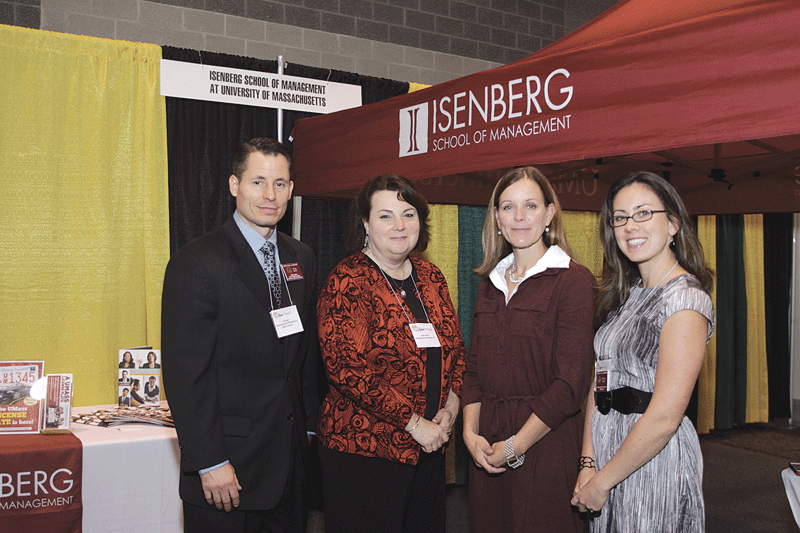 booth; Representing the Isenberg School of Management at UMass Amherst were, from left, Kyle Bate, academic advisor, Judith Miller, director of Undergraduate Online Programs, Jennifer Meunier, director of Business Development and Promotional Strategies for Professional Programs, and Trista Hevey, business development analyst; John Veit, marketing and recruiting coordinator with Meyers Brothers Kalicka, and Teresa Perkins, senior associate for the firm, talk with Susan Smith, director of Business Development for We Care Computers; Brendan Fontanello, promotions manager, and Christine Moauro, marketing and web advertising specialist, staff the abc40/FOX 6 Springfield booth. 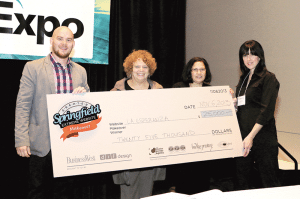 A special Pitch Contest & Demo Day showcased local entrepreneurs and those looking to get businesses off the ground. 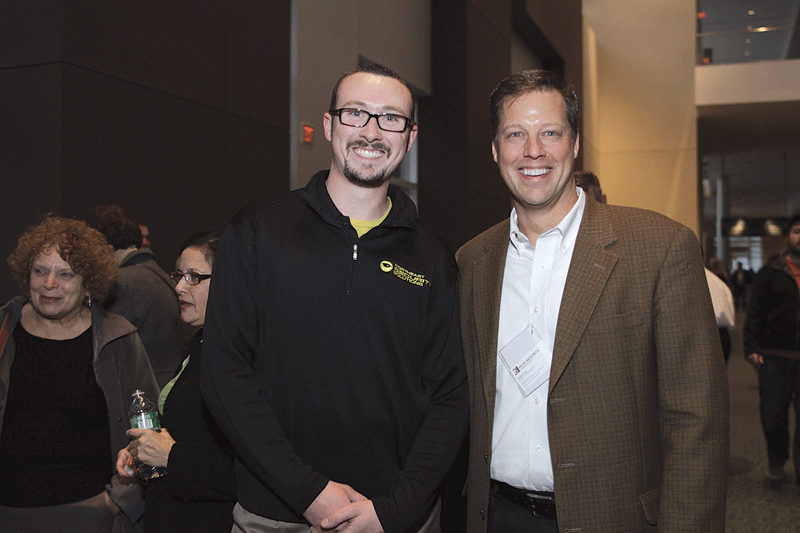 Left to right from far left: Dave (left) and Mike Mullen from KloudBook make their two-minute pitch. 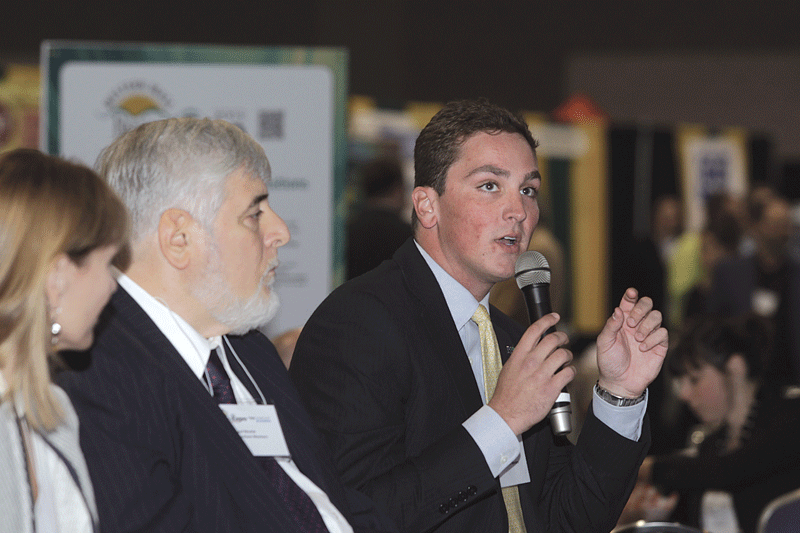 Bottom left: judge Ryan Walsh, operations manager from MassChallenge, makes some comments to one of the presenters. 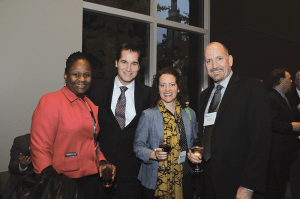 The other judges were Paul Peter Nicolai, principal of Nicolai Law Group P.C. 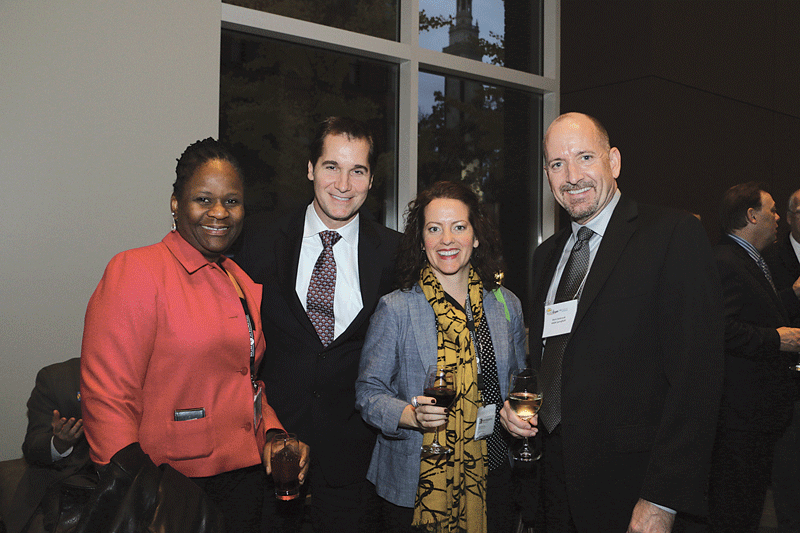 (also pictured); Linda Peters, with the Isenberg School of Management at UMass; Stephen Davis, with the Irene E. and George A. Davis Foundation; and Joel Vengco, vice president and chief information officer, Information & Technology, for Baystate Health. Above: the pitch contestants contestants included, from left, Daniel Ross of Mission Control, Mike Mullen from KloudBook, Kacey Clark from PeopleHedge, MJ Jang from Voncierge, Natasha Clark of Lioness magazine, Richard Stevens from Worksafe Technology, Diane Pearlman from Berkshire Film and Media Commission, Dan Koval from Worksafe Technology, Dede Wilson from Bakepedia, Marcie Muehlke from Celia Grace, Dave Mullen from Kloudbook, and Dino Larouche from KnowledgeWare21. 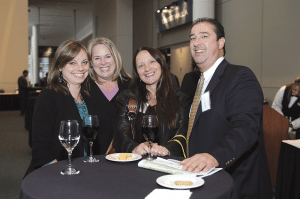 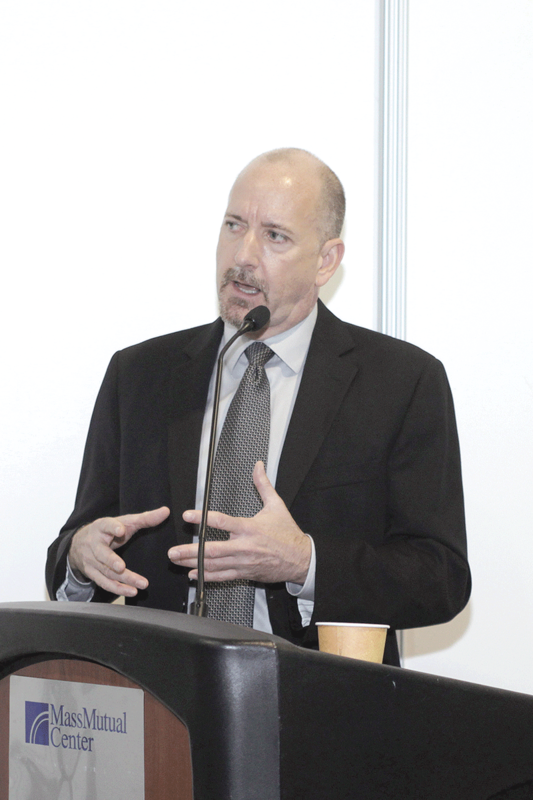 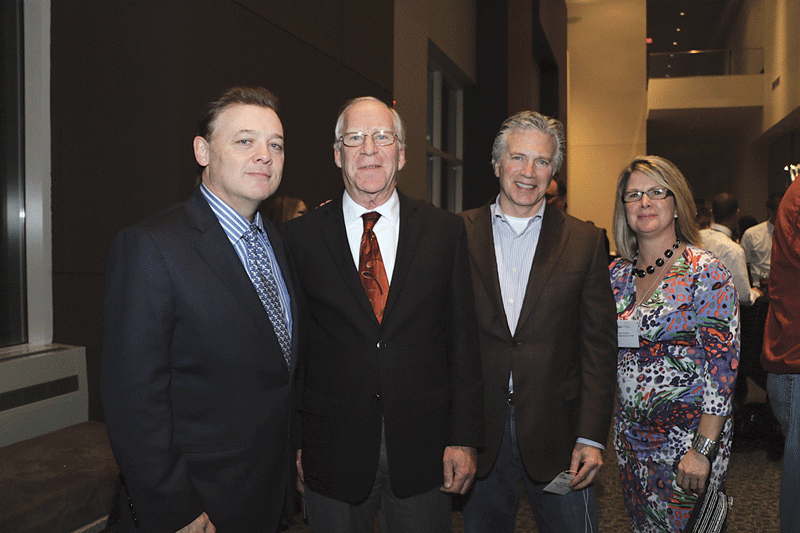 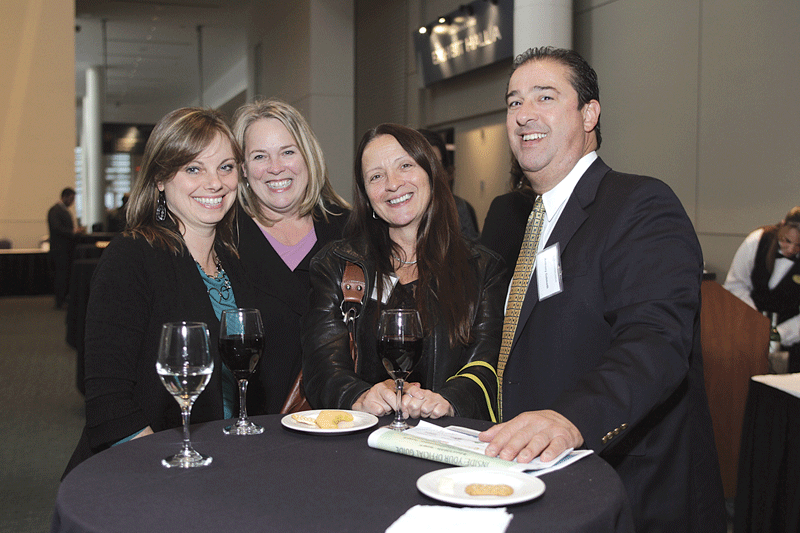 The Expo Social, the day-capping networking event, drew a large crowd. 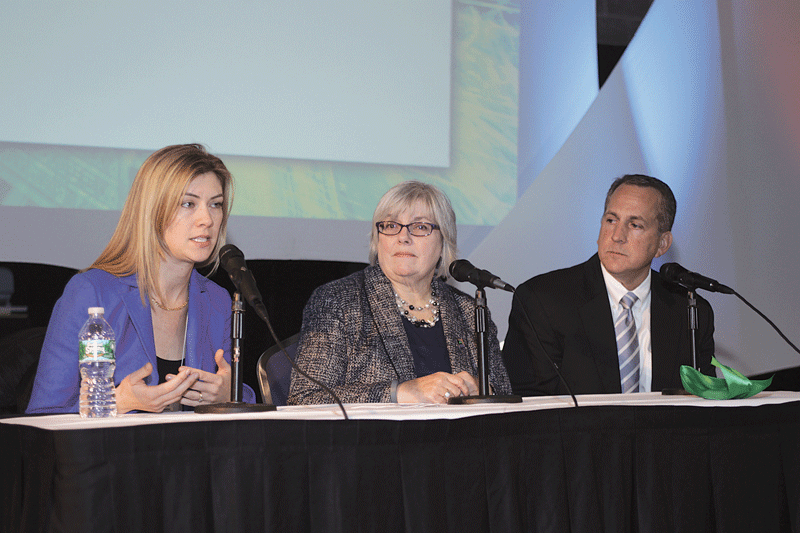 Left to right from far left: from MGM Resorts International, from left, Gerri Harris, director of Contract Administration, Frank Scharadin, executive director of Strategic Sourcing, Michelle Reichert, strategic sourcing manager, and Mark Stolarczyk, vice president of Global Procurement; from left, Kristi Reale, senior manager of Meyers Brothers Kalika, P.C.,Teresa Utt, senior account executive for Andrew Associates, and Joanne Haley, senior associate, and Anthony Gabinetti, senior manager, audit and accounting, both with Meyers Brothers Kalicka; from left, John Gormally, publisher of BusinessWest and owner of WGGB abc40/FOX 6 Springfield, Jeff Ciuffreda, president of the Affiliated Chambers of Commerce of Greater Springfield, John Garvey, president of Garvey Communication Associates and board member of Valley Venture Mentors, and Dawn Creighton, regional director of AIM; David Condon, owner of Northern Security Systems (left), and Jim White, co-owner of Go Graphix.